I’ve perused quite a few cookbooks in my time and the past year reading about kitchen science. The science behind how stuff works in the kitchen and the why. Although I am no expert in science beyond high school AP Biology, I found the following very very interesting. I will try to site my sources because what really irks me sometimes are statements on the internet with no references. Most of these are from the book I am currently reading: “What Einstein Told His Cook” by Robert Wolke I have read part of his second book, but most of it didn’t interest me as much as the first book. 2. Adding salt to water when cooking pasta does NOT make it cook any faster. Well, maybe like .01 seconds faster. It is to add flavor. But not save time. 4. Potatoes will not make a too salty soup taste less salty. They do not “absorb” enough salt to make the soup less salty. 5. I always wondered why my tea doesn’t taste as good when I microwave the water vs. boiling it in a kettle. Water must be boiling hot to extract all the flavor and color. Caffeine won’t dissolve until 175 degrees. The microwave looks like it is heating up the liquid enough, but it actually isn’t as hot. And the microwave only heats up the outer inch of the mug of water leaving the inside relatively cooler. 7. I always see Rachael Ray rolling her lemons and limes before extracting the juice. “It helps get the juice out,” she says. Per Wolke’s experiment, it didn’t matter whether you rolled or just juiced the citrus. So save yourself some time and skip this step. The experiment was tried both hand squeezing and with an electric juicer. All the results were the same – roll it or just go ahead and juice it. Rachael, I feel so betrayed. 8. From Wolke’s sequel book, I learned that baking soda in your fridge does nothing. It’s a complete waste of money. Now, if you use activated charcoal… that will absorb odors. But baking soda sitting in the fridge doesn’t go out and attack odors – it just sits there! I haven’t done this for years, but now feel silly for the earlier years I did this. It’s what my mom always did, so I thought it was right. But! If you roll the fruit and then microwave it, you get tons more juice. 26% more. I noticed a few years back that Costco had cute little individual cartons of chocolate milk. Everyone now sells the little Horizon cow chocolate milk containers it seems, but I wondered… there’s milk in here! Why isn’t this being stored in the fridge?? And I finally got my answer on page 92 of Robert Wolke’s book. The book was published in 2002, but the ultra high pasteurization method described is exactly the same one described on the Horizon Milk website. I quoted Robert Wolke’s book because I found the information a little more thorough than the Horizon milk explanation. (Like the fact they don’t mention hydrogen peroxide…) Probably should cite this properly, eh? From page 92 of Robert E. Wolke’s “What Einstein Told His Cook” published in 2002 by W.W. Norton and Company. 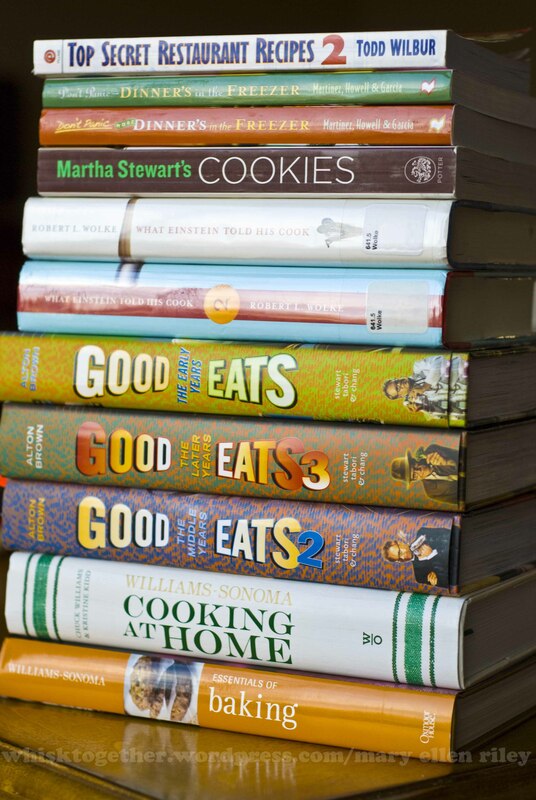 These are the books I have enjoyed that not only explain the recipe, but why it works. Some famous recipe books I’ve used recently and other recipes in big name books from friends said the recipe did not work at all. 1. “Good Eats” series by Alton Brown. He explains these recipes as “applications” so you can do your own thing. 2. “America’s Test Kitchen”. They take 2-3 pages of explanation PER recipe. Plus every recipe I’ve tried has been delicious. 3. Shirley Corriher’s “Cookwise”. She is one of the top scientist/chefs and it shows. I did not try the recipes, but the explanation was very thorough. The downside was this book is more like a textbook. Wolke’s and Alton’s books have science in them, plus they throw in some humor. 4. Pamela Anderson’s “The Perfect Recipe”. For tea I use a $12 water kettle. It boils water faster than the microwave, shuts itself off, and my tea tastes better. I thought it was my imagination, but you’ve just proved me right! I love my water kettle, too! Though my husband got me a Kuerig machine for Christmas… but that’s okay. The water is still heated to 190 degrees.